On behalf of our School Council, please save the date for an upcoming community event at Yogurty’s (corner of Dufferin and Autumn Hill) on Wednesday,May 14, 2014 from 6:00 p.m. to 9:00 p.m. 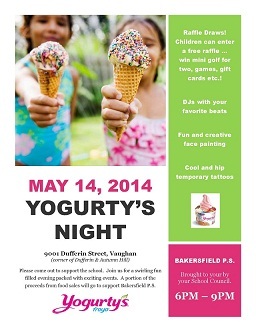 There will be a D.J., face painting and a raffle … and of course, delicious frozen yogurt! There is no cost to attend the event, and a portion of any food sales from the evening also goes to the school, so please consider coming out to enjoy an evening together. For more information, please see the flyer. School Council would also request any community members who would like to make donations of items that would be suitable for raffle prizes, to please do so; it would be greatly appreciated. You can contact School Council at bakersfield.ps@sc.yrdsb.edu.on.ca or simply drop items off at the school.